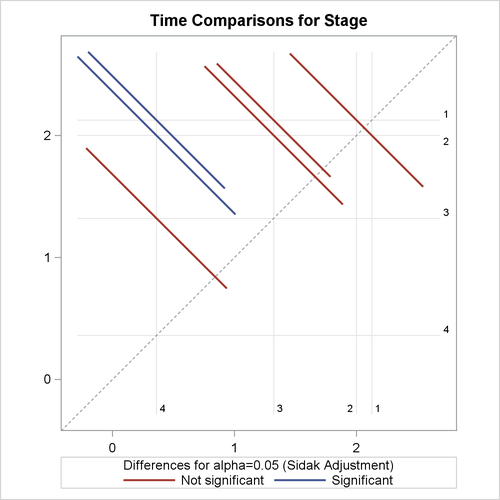 The LSMEANS statement compares pairwise differences in survival times among the four different cancer stages, while adjusting for age. The ADJUST=SIDAK option uses the Sidak method to control the overall Type I error rate of these comparisons. Results are displayed in Output 51.8.1. All the LS-means differences and their significance are displayed by the mean-mean scatter plot in Output 51.8.2. The CL option produces 95% confidence limits, including both unadjusted ones and those adjusted for multiple comparisons according to the ADJUST= option. Results are displayed in Output 51.8.3. 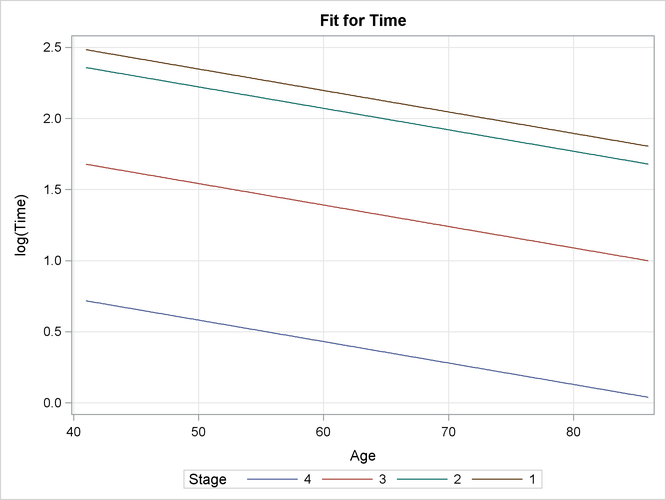 As displayed in Output 51.8.4, the EFFECTPLOT statement generates a plot of age effects on survival time on a natural logarithm scale by four disease stages. Because no prior distributions for the regression coefficients were specified, the default uniform improper distributions shown in the “Uniform Prior for Regression Coefficients” table in Output 51.8.5 are used. The specified gamma prior for the scale parameter is also shown in Output 51.8.5. Under the Bayesian framework, the LS-means differences are treated as random variables for which posterior samples are readily available according to the linear relationship of LS-means and the regression coefficients. Output 51.8.6 lists the sample mean, standard deviation, and percentiles for each LS-means difference. The LSMESTIMATE statement produces summary statistics of the posterior samples for the specified LS-means contrasts. Results are presented in Output 51.8.7; they are very similar to the results based on maximum likelihood in Output 51.8.3. The PLOTS= option uses ODS Graphics to display the Bayesian samples. 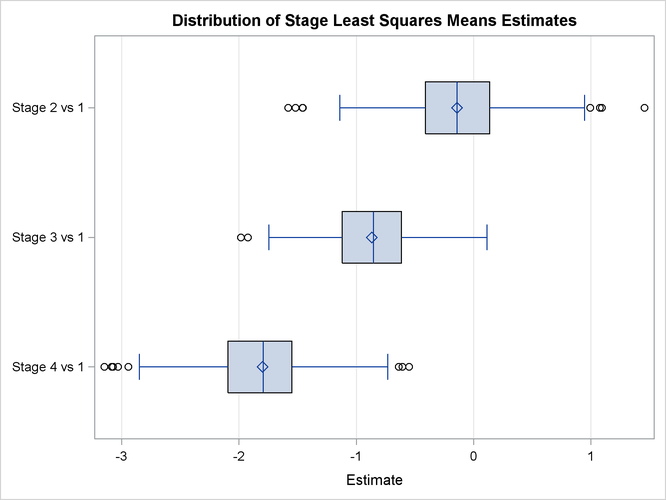 A box plot is presented in Output 51.8.8.